Here's the setup shot for the photo I posted yesterday: www.facebook.com/photo.php?fbid=10151717547866660&set... 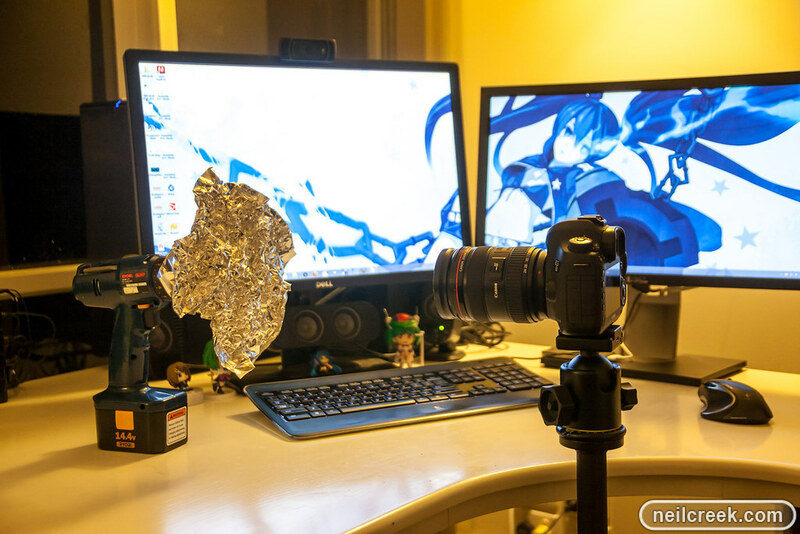 I took a sheet of aluminium foil, crinkled it up a bit, and stuck it to my power drill, using a pen taped to the drill chuck for support. I set the camera up on the tripod with a 2 second delay and a 0.5sec exposure time. Before the timer finished I started the drill up and slowly spun the foil. This reflected the warm lights in the room, as well as some blue highlights reflected from my monitor. The spinning effect was very effective over the exposure duration!